I’ve spent years, decades even, going to tradeshows – as they remain the most economical way to bring both buyers and sellers together. If you think about it, what other way do you get to see so many potential customers in just a few days? Yet, even though the cost per customer is low, the cost of exhibiting can be exuberant – especially on a small business. 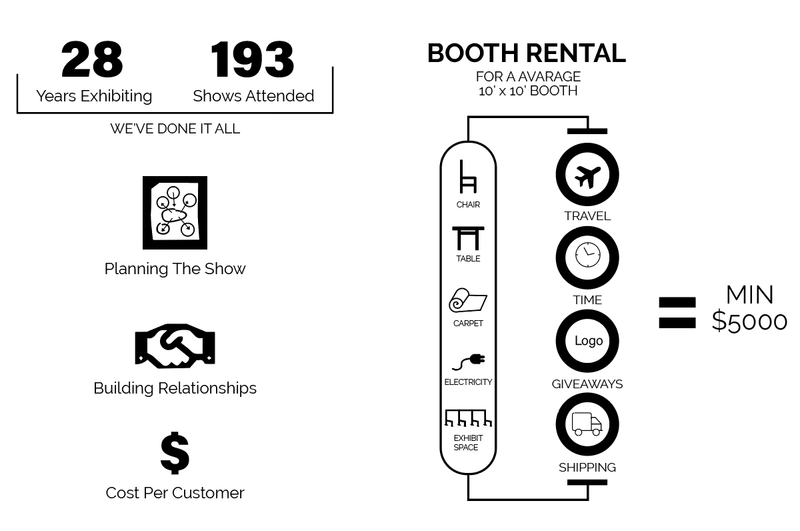 Once you calculate booth rental, all the add-ons like tables, chairs, carpet, electricity, plus your travel expense, most shows end up costing a minimum of $5000 for a 10×10 booth. It’s not just the monetary cost too, but the time spent as well! Consider the time spent to prepare, set up, tear down, plus travel. Instead of all the headache and cost lugging that thing around I thought “Hrrm, I’ll just print the graphics on fabric…and then create a way to attach it directly to the booth,” so…that’s what I did. At first I used the new creation as a big way to brand our company, but the more successful it became, the more I started printing our product line on the backdrop and using it as a line card. So then, I could ship even less stuff to the show. Now, I solely bring just a printed backdrop, tailor made to the specific trade show audience I’m working with. It’s so affordable, that I can easily change the backdrop from show to show! As the industry evolved I saw a greater need for a simple, show stopping display that could even be used at a non-booth show. Thus, the CEB Plus Kit was born. This kit included a simple, easy to assemble, portable, and collapsible frame. The kit also included the components need to attach to the traditional trade show booth, but now it had the best of both worlds in one. So now, If I’m not the last to the show and first one out…I know I did it wrong. I’m able to spend more time selling and less time worrying about all the headaches of a typical trade show. Give CEB a try and we’re sure you’ll never go back to the old way again! Custom Exhibit Backdrops™ was developed to address a critical need in the trade show industry for a quick and easy, professional, and portable trade show display. Our specialty is printing on fabric to create unique trade show backdrops, banners, and table skirting. At CEB we believe in the “white-glove” level of service. With each order you will have access to a dedicated sales account executive as well as an in-house graphics team (at no extra cost) that is set up to take your design to the next level. We hope that in working with us you will be confident that you have a trade show setup that will be eye-catching, compelling, and portray your message that you want your potential customers to know. We look forward to helping with your next project! All of our products are printed using a specialized printer that utilizes the process of dye sublimation. We chose this style of printing over traditional printers or printed vinyl and the like because of its superior quality. 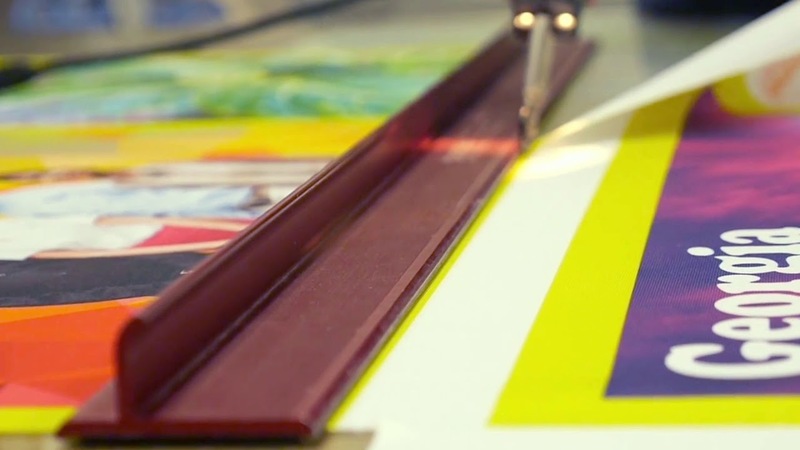 Dye sublimation printing actually heats the ink into the fabric, rather than printing onto the fabric. The result is a bright, vibrant, photo-realistic image that does not peel, fade, or distort over time. All of our backdrops are made from the highest quality 9oz polyester fabric. These backdrops are Inherently Flame Resistant (IFR), wrinkle-resistant, and retain their vibrancy over time. Custom finishes such as grommets, hemmed edges, pole pockets, and the like are available on request. With a fully-staffed sewing department, in-house graphics design team, and dedicated account representatives we’re proud to say that CEB is equipped to handle any order, large or small, with the highest possible customer service and quality.